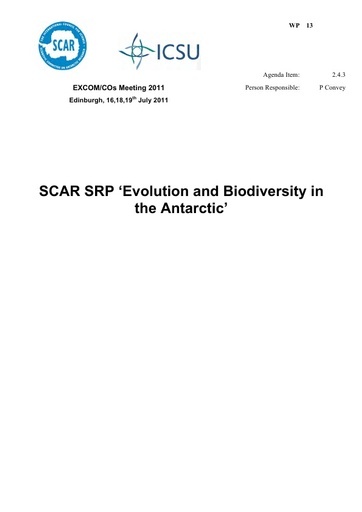 Introduction/ Background: EBA is one of five current approved Science Research Programmes of SCAR, and the only one representing the interests of the very large and diverse biological sciences research community with interests in Antarctica. The Programme has a planned lifetime of 2005- 2013. Work under the auspices of EBA is divided into five ‘workpackages’, each working in both the marine and terrestrial environments of Antarctica. Important Issues or Factors: Since the Programme’s last Report to Delegates in 2010, and building on the very positive review of EBA science and outputs carried out by SCAR in 2008/9, the programme has continued to be very active in its primary coordination role, catalyzing interactions amongst the SCAR biological community. EBA is now in its final 2-3 year period. Major delivery aims in this period are (1) for each component workpackage to organize a themed conference session/workshop with planned/defined synthesis output, documenting the ‘state of the art’ and major future challenges in their respective fields; (2) to propose an EBA ‘mini-symposium at the 2012 SCAR OSC, where single overview presentations of progress under each workpackage, and for the programme overall, will be presented by package and programme leaders, ideally to be accompanied by an appropriate publication output; (3) to play an active and central role in the development of proposals to SCAR for successor SCAR biological and cross-disciplinary research programmes. Expected Benefits/Outcomes: Significant continued publication output (both content and numbers), outreach delivery, advice to stakeholders, enhancement of SCAR profile.